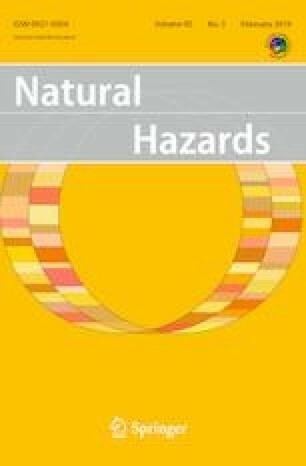 Based on the classification results of marine structure accidents induced by sea ice, the risk assessment index system of sea ice disasters was established. The possibility coefficient of risks was proposed based on risk factors of sea ice disasters, including sea ice conditions, ice risk status, ice resistance in the design phase, the current defense ability in the operation phase, and management behaviors in the freezing period. The severity index should be determined according to the affected scope, the distribution of affected personnel, and the monitoring ability in emergency. According to the case study and expert evaluation method, the scores and levels of sea ice disaster risk assessment indices were determined. Finally, the sea ice disaster risks of two offshore oil platforms and a coastal nuclear power plant were assessed. The original article has been updated to emphasize and correctly list the article’s funding information. The original article has been corrected. The online version of this article ( https://doi.org/10.1007/s11069-018-3463-0) contains supplementary material, which is available to authorized users. This study is financially supported by The National Key Research and Development Program of China (Grant No. 2017YFQ0604901), Public Science and Technology Research Funds Projects of Ocean (Grant No. 201505019), National Natural Science Foundation of China (Grant No. 41676087).